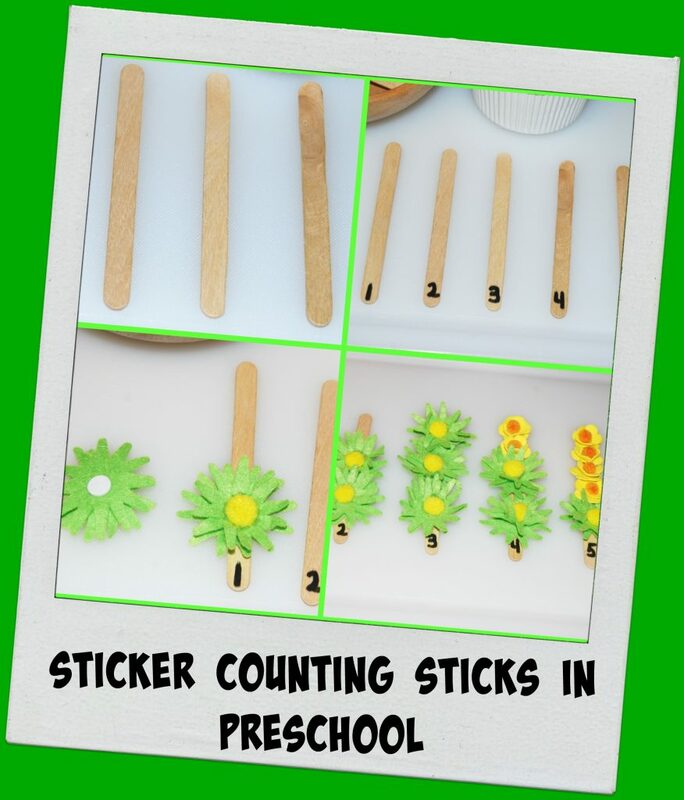 Sticker Counting Sticks in Preschool! This week the #PlayfulPreschool Blogging Team is offering playful learning activities centered around a STICKS THEME for preschoolers! Please take a moment to visit the other activities linked at the bottom of this post for great ideas to use this summer (or throughout the school year)! Objective: To encourage practice with 1-to-1 Correspondence through the use of activities that encourage playful participation. One-to-One Correspondence is the knowledge that a certain number relates to a specific quantity of objects. The goal is to help young children gain confidence not only with number recognition, but to help them move beyond just recognition and towards the question: How many items make up any specific number? 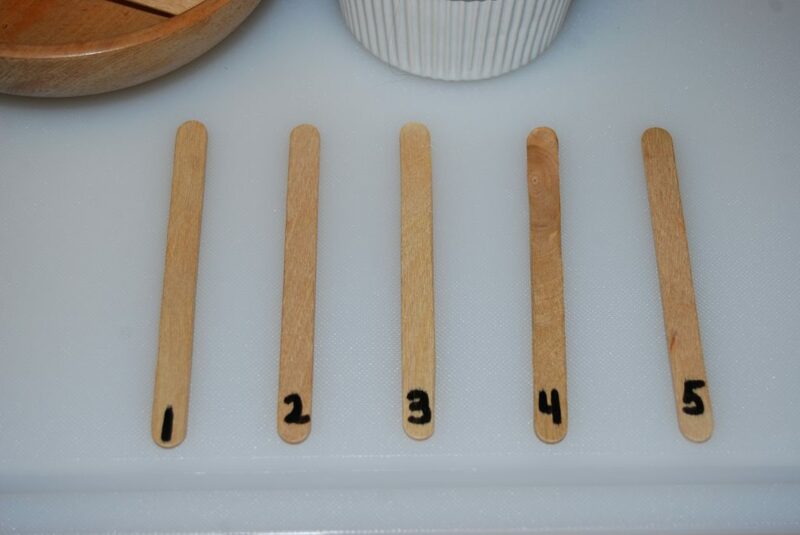 Prior to the activity: label 5 craft sticks with the numbers 1-5 and set out on a table or a large tray. Place small stickers (any kind your children like will do) in a bowl. To begin, use only the amount of stickers necessary to complete the number of counting sticks desired for the activity. Invite the children to count out the number of stickers that correspond to the number indicated by each of the counting sticks. Remind the children to count out loud as they peel and place each sticker on the numbered craft sticks. As the children master 5 craft sticks, use larger numbered craft sticks for counting practice (for larger numbers, large craft sticks are necessary for the required sticker space). The activity provides great visual and tactile skills for encouraging one-to-one correspondence. 1). Label 10 craft sticks with the numbers 1-10. 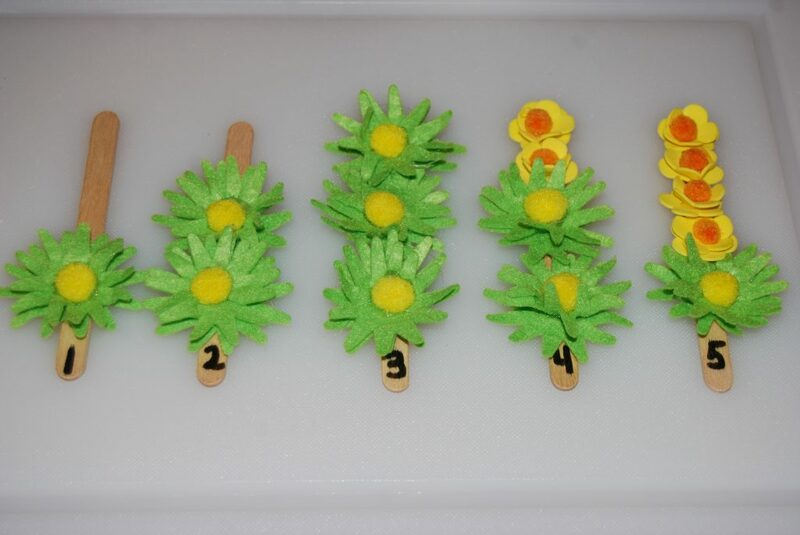 After the children add the corresponding number of stickers to each craft stick, randomly shuffle the sticks and invite the children to place the sticks in correct number order beginning with the number 1. Variation: Label the sticks with the numbers 5-15 and have the children work to place the craft sticks in the correct number order (starting at a number OTHER than 1). 2). Label 10 large craft sticks with the number 10 and invite the children to place 10 small dot stickers on each of the craft sticks. The sticks make great “10 bars” for counting to 100 by 10’s. For younger children, label the individual craft sticks with various numbers for practice with skip counting by 2’s and 5’s. 3). Write the number WORD on the craft stick and encourage the children to place the corresponding number of stickers on each stick. 4). Write any basic pattern on the craft sticks (ex: AB, ABC, AABB, AABBCC). Invite the children create those patterns with different sticker designs. For older children: use a wider assortment of stickers for more complex patterning. 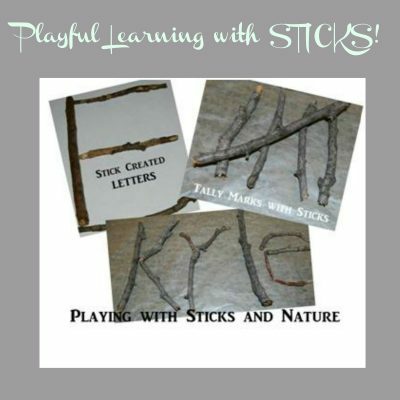 For MORE ways to play and learn with STICKS, please see the wonderful activities below! Ohhh fun – I’m going to set this up for my little one this week. Thank you for the inspiration. So fun! I love that it is so easy to do! Two of my kids’ favorite things- sticker and sticks! A super smart and easy idea.